I had to keep updated on this game via Gameday on the cellular device. I was so ecstatic when the M's scored 6 runs in the 4th inning and batted around that I was cracking jokes about Justin Masterson not being so masterful. Then, I took my eyes away from the game for about 45 minutes and I was literally giddy about the 7 run deficit we had put the Indians in. I had no idea that I would be faced with such a tragic scene next time I pulled up the game on my phone. The Indians had somehow answered back with a 7 spot in the next inning and tied the game at 8 a piece. Really? What a joke! Kevin Millwood totally fell apart. 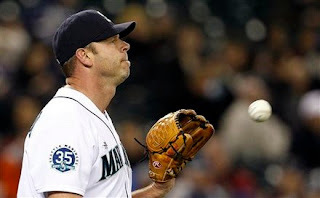 He gave up 6 runs in the inning, 7 total, before being replaced by Erasmo Ramirez. Ramirez didn't have much luck either as he gave up a run of his own after loading up the bases. In the seventh, Charlie Furbush allowed a lead off single and a walk, but then proceeded to strike out the next two hitters. 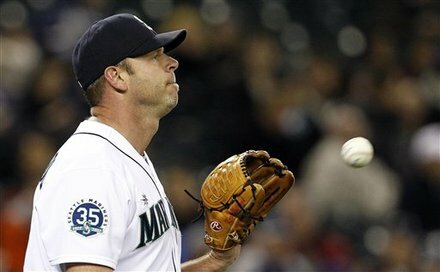 Then came Eric Wedge out of the dugout and he switched Furbush for Tom Wilhelmsen. Wilhelmsen gave up a single to Jason Donald to give the Tribe the lead. Now, I've gone from ecstatic and giddy to absolutely irritated by this point, but what would happen next would have me just down right angry. In the bottom of the ninth, with runners at first and third and only one out, Michael Saunders came up to the plate. We all know this as a situation that there are no excuses for not getting that runner at third home, but, Saunders didn't get it done. He hit the ball in the air, but he didn't hit it far enough. Two outs and John Jaso came up and flied out to right field. The problem with that? Brendan Ryan walked on four straight pitched in the previous at bat. Jaso had the count 2 and 0 and went hacking at a pitch that was up in the strike zone. Maybe it was the best pitch that Jaso had ever seen in his life, but when a pitcher throws 6 straight balls in a row, I would imagine that one would make him throw a strike before you just start hacking. Maybe that's just me. So I had a myriad of thoughts after the game was final. One, I wanted to quit writing because I couldn't bear the depressing news, and two, I realized the vast array of youth that we threw at the Indians in the late innings in Ramirez, Furbush, Wilhelmsen and Lucas Luetge, and three, I wondered if we have ever come back in the late innings this year and won a game. I answered the last question as I remembered our one win against Texas. Both of Texas' losses came via a blown save by Joe Nathan. It seems to me that the team gets the wind taken out of their sails rather easily and are in desperate need of a cheerleader. The horrible performances of this game from a pitching standpoint and from the missed opportunity in the ninth, I would have anticipated Eric Wedge to be fuming after a game like that, but he wasn't. In fact, all he said after the game was that everyone is battling to be better and that we would be better. It's still early in the season and I cannot complain about being .500 right now, but we should not have lost this game. If nothing else, we should have at least tied it in the ninth. The positives, Justin Smoak went 4 for 5 with an RBI. John Jaso was 1 for 4 with 3 RBI and 2 runs scored. Kyle Seager was 2 for 5 and Brendan Ryan went 0 for 1 with 4 walks. It wasn't a terrible night offensively, we just couldn't hold onto a seven run lead after the fourth. That my baseball friends, is pretty pathetic! Hopefully the next two games we have better luck, but there is something about the Tribe playing at Safeco Field that doesn't suit the M's very well. Maybe it's because there are more Cleveland fans showing up to the games than Mariner fans... maybe?